Did somebody mention introverts? Hello, Ed Bickert. The so-cool dean of Canadian pickers, Bickert seems to be playing in his sleep. But his stripped-down melodicism and metholated charm show how aware he really is. Lorne Lofsky, another Torontonian but rather younger, is a good match for Bickert. Lofsky’s playing is just a touch more modern than Bickert’s perpetual mis-50’s cool, his tone just a bit harder-edged. Together, they ease through a bunch of standards (Namely You, The Star Crossed Lovers), neither rushing nor competing. Bassist Neil Swainson and drummer Jerry Fuller take the hint, and deliver more restrained accompaniment than we’re used to hearing from them. It’s all very polite. Jazz for a Sunday afternoon with your favorite sweater and your dog. It’s also first-rate. Two prominent Toronto guitarists–Bickert, 57, and Lofsky, 36–join with two of Canada’s best rhythm purveyors, bassist Neal Swainson and drummer Jerry Fuller, for a low-key collaboration on tunes mainly written by fellow jazzmen (Wes Montgomery, Cedar Walton, Horace Silver, Steve Swallow). Each has a solo track; Lofsky’s harmonic grace is well displayed in the Ellington-Strayhorn “Star Crossed Lovers.” Both men deal ingeniously with Charlie Parker’s contrapuntal theme “Ah Leu Cha.” A superior sampling of north-of-the-border jazz. 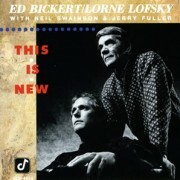 Ed Bickert and Lorne Lofsky are a couple of Canadian guitarists who are already widely known in jazz circles. One would hope that their recorded get-together, “This is New” (Concord Jazz CCD-4414), will find many new fans. Supported by two of their countrymen, Bassist Neil Swainson and drummer Jerry Fuller, Bickert and Lofsky weave single-noye lines and chords in lyrical, spontaneous and loosely swinging fashion here. Four Stars. Two prominent Toronto guitarists…Bickert, 57, and Lofsky, 36…join with two of Canada’s best rhythm purveyors, bassist Neil Swainson and drummer Jerry Fuller, for a low key collaboration on tunes mainly written by fellow jazzmen (Wes Montgomery, Cedar Walton, Horace Silver, Steve Swallow). Each has a solo track; Lofsky’s harmonic grace is well displayed in Billy Strayhorn’s “Star Crossed Lovers.” Both men deal ingeniously wth Charlie Parker’s contrapuntal theme “Ah Leu Cha.” A superior sampling of north-of-the-border jazz. The title notwithstanding (it is the name of the leadoff Kurt Weill-Ira Gershwin tune), there is nothing really new here in a progressive sense. Rather, this is an engaging opportunity to catch up with guitarist Ed Bickert, one of Canada’s better-kept secrets (Concord Jazz CCD-4414). Bickert tends to stay at home in the Toronto area, out of the reach of the publicity mills, so Concord often goes to Canada to record him. Here, an all-Canadian team of bassist Neil Swainson, drummer Jerry Fuller and guitarist Lorne Lofsky, join Bickert in aswinging, smooth-as-glass, hourlong set of mostly out-of-the-way pop and jazz standards. Far from being overmatched, the young Lofsky offers a sharply etched, equally inventive counterpoint to the subdued yet tasty imagination of Bickert. Along the way, both glide through some relaxing mainstream grooves.